The Cavaliers answered the Bulls' aggressive first half. Bulls rookie forward Lauri Markkanen late Tuesday night was walking out of the Quicken Loans Arena after the Bulls' 119-112 loss to the Cleveland Cavaliers. Markkanen, who was terrific again with 19 points and eight rebounds, bumped into Cavs forward Channing Frye. Which is only significant because that's who many believed Markannen to be in the NBA, another perimeter shooting big man specialist. "Man, you can really shoot that ball," Frye complimented. 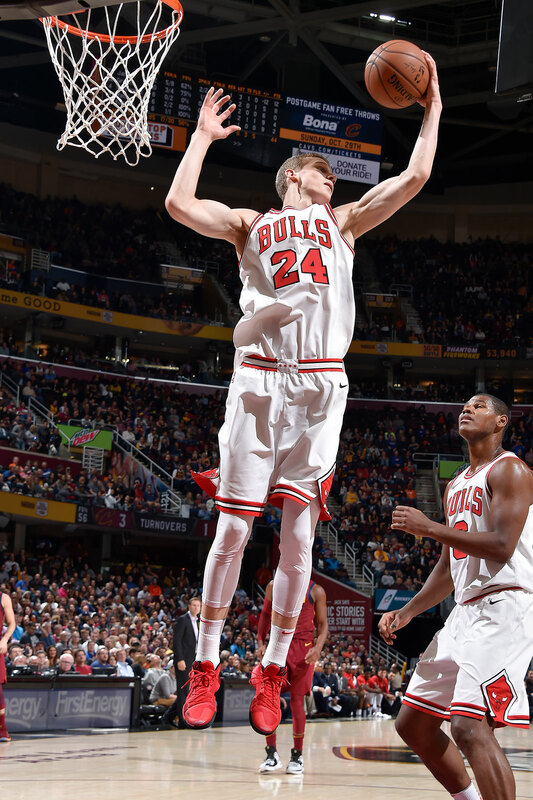 Markkanen really can, and for the Bulls good fortune he can do so much more as the Cavs after trailing the Bulls 68-65 in a wild first half took to double teaming and blitzing the Bulls rookie to slow down the Bulls. It worked as Markkanen had just two points and four shots in the second half. But the 20-year-old from Finland continues to open some eyes, and in the process likely lighten some of the hearts of Bulls fans. "It was great to see Lauri get off to that start (11 first quarter points and three consecutive three pointers)," said Bulls coach Fred Hoiberg. "I thought our guys did an excellent job of finding him. We got him in transition several times out of our flow offense; third quarter they made it a point switching out to him. He's going to be a heck of a player and to see him out there battling the way he did against this type of competition on the road says a lot about him." Justin Holiday led seven Bulls players scoring in double figures with 25 points and Kay Felder off the bench added 13 points in 15 minutes. 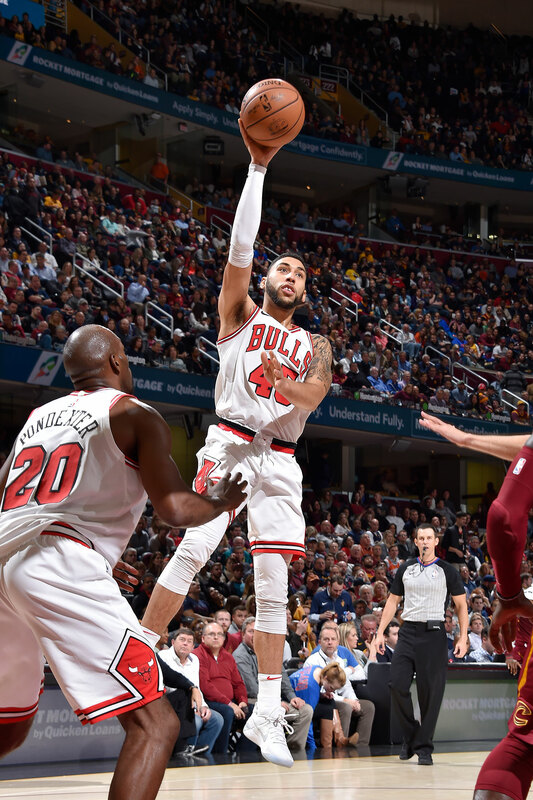 Denzel Valentine also had 13 points with three of four threes. 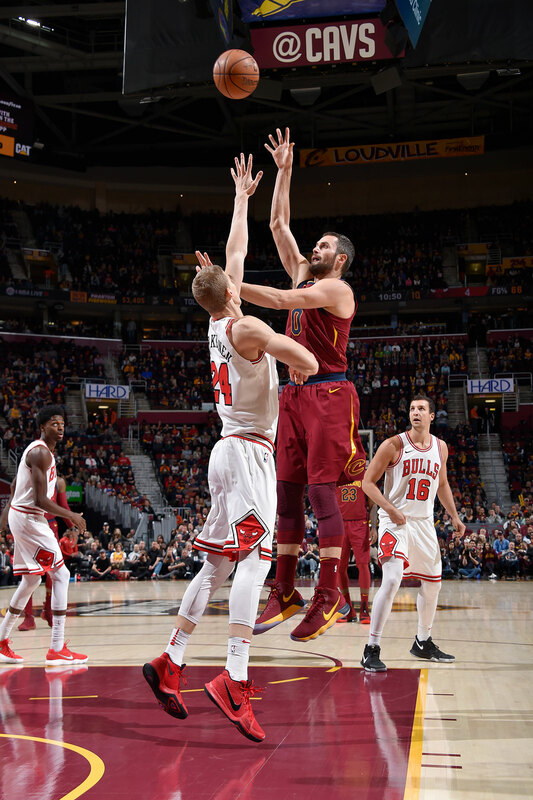 But it was Markkanen with an NBA record 10 three pointers for his first three NBA games after five of eight Tuesday who early in the game drew the gasps of the Cleveland NBA-TV national audience. "Made a couple of my first ones and kept it going; didn't play that well the second half," offered the laconic seven footer in almost a speech for him. "I'm expecting good results, personally, every time I go on the court; I feel that's the only way to succeed. We haven't won a game yet, so I'm not very pleased." Markkanen, the seventh overall pick in last June's draft from the Jimmy Butler trade, often doesn't have much to say, especially about himself. But others do. Derrick Rose, who sat out the game with a sprained ankle, offered unsolicited before the game how he was impressed with Markkanan. Then afterward, LeBron James, whom Markkanan said he idolized as a youth (well, which Markkanen still is), said he was impressed with Markkanen's confidence. "Very confident kid," said James, who was brilliant with 34 points and 13 assists and, at times, seemed to match every Bulls run on his own. "Can shoot the heck out of the ball. He's going to continue to get better." James' new running mate, Dwyane Wade, now Cavs sixth man and with 11 points, said he's been watching Markkanen and isn't surprised. "You can see if a guy knows how to play basketball when you first see him," Wade said. "He's aggressive, looking for his shot. He understands they need him to score the basketball. I told Denzel and all those guys I love the way they're playing. I love the confidence they're playing with. They gotta keep that up, keep that confidence up no matter if they go on a losing streak, keep playing the way they're playing. They're having fun and that's what it's all about for them." The losing isn't a great joy as the Bulls fell to 0-3. Cleveland is 3-1. But this, in many respects, will be a season graded more on competitive spirit than results. And a chance, at least for now, to consider and perhaps fantasize a little about how Markkanen will be able to play once paired with a scorer like Zach LaVine and a point guard in Kris Dunn, the other two players from the Butler trade. After all, if the Bulls can produce this kind of game on the road against the conference's best team with four regulars out of the lineup, well, maybe if you look in Lauri's, Kris' and Zach's eyes and then suddenly realize. "What we are trying to do day in and day out is improve and we improved today 100 percent," said Holiday. "I think our energy and ball movement and assertiveness when we came into the game was very important and when it happened it showed. We know who we are playing; this is a team that's in the Finals every year. I think we still did a great job. Sure, with those amount of points, but we were with them. They are who they are. I felt we came out and played them as we should." In this zero sum world of sports, there's lately LeBron and the other guys, at least in the Eastern Conference. The Bulls have had success against Cleveland in recent years, though not when it counted most. And it figured to be even more difficult with the roster turnover, injuries and the recent suspension of Bobby Portis. Perhaps one could say, as many teams presumably will do, the Cavs didn't take the Bulls seriously to start. 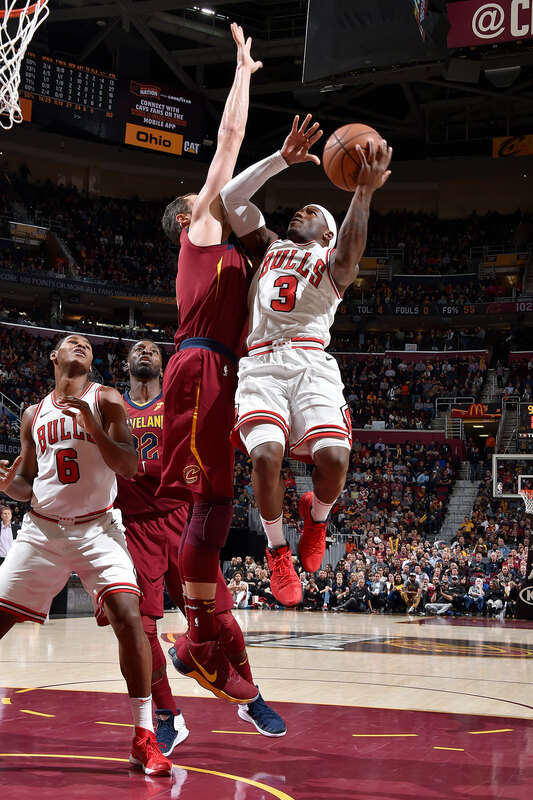 But that didn't last long when the Bulls bolted to a 12-2 lead in the first three minutes, necessitating a Cavs' timeout. From then it was on, and the Bulls didn't wither, either. The Bulls kicked their lead up to 14 points and 38-28 after one quarter, 68 points in the first half with 12 of 20 threes and just three turnovers. It showed resilience and growth from those two uneven losses to start the season. The Bulls for the game were 17 of 33 on threes, and like LaVine said this week, when the Bulls are making threes with this offense they'll be in games against any team. The 17 threes was one fewer than the team's alltime record. The Bulls shot 47.7 percent overall, but attempted just 13 free throws. "I'm really proud of the guys for going out there and battling the best team in the Eastern Conference," said Hoiberg. "I thought our intensity out of the gate was exactly where it needed to be; we were sharing the ball. Our ball movement was excellent, 28 assists on the night; 12 turnovers did lead to 24 points. Our turnovers were costly, but we cut down on the number. LeBron was playing at a whole different level in the first half hitting those shots (four of four threes). Showed why he is the front runner for MVP this season." Markkanen's shooting stroke is a thing of beauty for basketball aficionados. He walked into several threes early, easily flicking his wrist in transition and on down screens from Robin Lopez, who had 11 points, led the team in plus/minus as he often does, and banked in a three. It might have been one of those nights if not for LeBron. 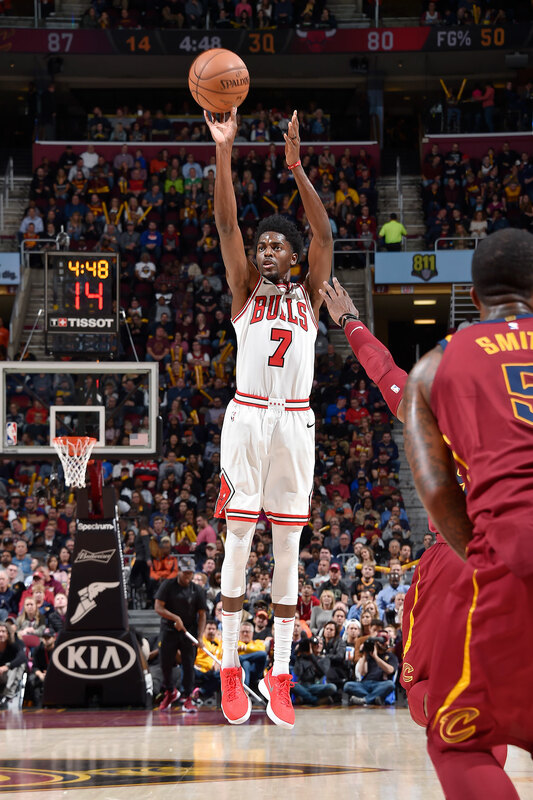 James had a dozen points in the first quarter and 11 in the second when the Bulls were riding Markkanen, Holiday and Felder, the latter late pickup with aggressive moves and a pair of threes. "Justin and Denzel got it going," said Hoiberg. "Jerian had a solid overall game. A lot of guys made contributions. I told the guys we go out and play with that type of effort, we're going to have a chance to win some games." It wasn't a good omen for the Bulls that after playing about as well as they could, and about as well as any Bulls team has offensively recently, they still were ahead by just three points at halftime. They didn't collapse even when the Cavs took an 81-72 lead early in the third quarter. The Cavs began attacking Markkanen, and the Bulls didn't do as good a job of moving him around and moving the ball. Plus, Hoiberg has been trying to manage Markkanen's playing time after Markkanen played so much for Finland in the European championships this summer. So Markkanan sat out a long stretch from the middle of the third quarter to the middle of the fourth. And still played 32 minutes. But you cannot ride a rookie who should be a college sophomore to save you. The Bulls committed four turnovers in six third quarter possessions with back to back 24-second violations. 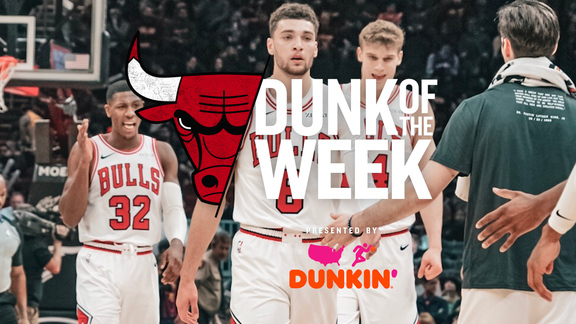 But Holiday and Valentine responded with consecutive scores each and after three quarters the Bulls led 92-91 with Cristiano Felicio finding Quincy Pondexter for a layup to close the quarter. "The Bulls don't have just one guy you can key in on now," said James. "They do a lot of dribble drags, a lot of back doors, a lot of movement and everyone is live. And they shoot the ball extremely well. We know the Bulls teams the last couple of years have not shot the ball from the perimeter as well as they are doing now. So you have to be able to guard the perimeter and guard the paint. But in the fourth quarter when we needed the stops we got the stops and executed on the other end." The Bulls had won seven of eight over Cleveland with Hoiberg as coach. But Hoiberg lamented the Bulls losing Kyle Korver for back to back threes early in the fourth for 102-96 Cavs lead. The Bulls still wouldn't die. They got it back to three with eight minutes left on a Valentine three. Jae Crowder then made a three, the Bulls missed twice and LeBron made a fabulous behind the back bounce pass for a Kevin Love layup and then James left tire tracks running over David Nwaba on a scoring drive. The Bulls' deficit became too large, 11 points with four minutes left. The Bulls had their shot; and it was impressive to watch. Especially Markkanen's.